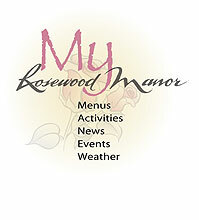 Our full-time Activities Director ensures that there’s never a dull moment for residents of Rosewood Manor. The following are just a few samples of activities that are planned for the enjoyment and stimulation of our residents. Fun and Fitness – a critical component of our daily schedule, these activities help residents maintain mobility, strength and flexibility. Continuing Education – we welcome various community groups into Rosewood Manor to provide presentations on topics of interest. Crafts – there is always something exciting being created in our activity room.